Reviews | One Piece Flat Bottom Aluminum Scoop - 4 oz. One Piece Flat Bottom Aluminum Scoop - 4 oz. Perfect for scooping small portions of shelled peanuts or wrapped candies, this sturdy 4 oz. aluminum scoop features a flat bottom design to easily access the bottoms and corners of containers. The flat bottom also allows the scoop to sit flat on countertops and stack nicely while not in use. These flat bottom aluminum scoops were perfect for scooping up ice. They’re attractive ,durable and held an ample amount of ice for transport to cups and ice buckets . We can scoop so much wonderful ice, granola, and other things this. We are blown away!! Anytime we need to do some scooping - we know we can count on this one piece flat bottom aluminum scoop! Exceptional quality aluminum scoop for an exceptionally low price. It has thick walls with a nice good looking frosted texture. The handle itself feels very sturdy well attached to the scoop. 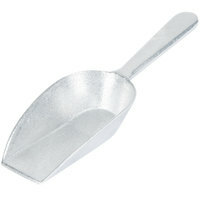 This aluminum scoop comes in really handy for scooping large quantities of sugar or flour. I often just keep the scoop in my flour bin! A+ item is as described! Light metal color. The scoop is on the smaller side, which is perfect for our 1/2 gallon and 1 hall clear jars. We use to scoop ice cream roll mix-ins like cereals and granola. These are the perfect cereal and candy scoop. We use the large polycarbonate storage containers for our household cereal and these are great for scooping it out in the morning. The size is amazing, two scoops will fill a cereal bowl. The flat bottom is great for storing them in the drawer, the don't roll around and go missing, they just nest inside each other. The texture and material of this scoop make it seem like it will last forever. The metal doesn't chip off or rust. Easy to hold and use. Sits flat on the counter when not in use. We have a lot of these and they work pretty well - very versatile! I just prefer the more rounded scoops though so I'm usually grabbing for those. These are really good and useful scoops. They are super easy to use and great for portioning or ice scoops. They came in handy in my restaurant. I would highly recommend this scoop to anyone. It's very heavy considering how affordable it is and if you order multiple they stack well. I would order again. Without a doubt, I would highly recommend this four ounce aluminum scoop. Its uses are endless with the durability to match. I appreciate the fact that I can scoop anything from hard ice to soft fresh popcorn with no problems and cleaning after is as easy as can be. I have no complaints, it is great and I would definitely recommend! I love these scoops. I ordered quite a few and when they arrived the weight of them really surprised me. These are quality, no doubt about it. I love these scoops. They are very affordable and surprisingly heavy considering the low price tag. They will scoop everything from ice to toppings to candy. These little scoops will be perfect for my candy bar and my bridal shower, and they are surprisingly VERY heavy duty for the price! I definitely recommend these, they are the perfect scoops, and the perfect size for scooping candy! I got these scoops to use for a candy bar at my sons birthday party. They are a lot heavier than I expected and fit perfectly into the anchor hocking .5 gallon jars. The One Piece Flat Bottom Aluminum Scoop definitely exceeded my expectations. The quality is excellent and the price is reasonable. Works great for serving ice. Highly recommend! out of the 5 different scoops i ordered here from webstaurantstore, these were my favorite. they are really strong and can handle heavy or hard objects no problem. the price can't be beat. This was just what I was looking for to portion out chocolate chips and candy. I also purchased an extra one for scooping cat food. The 4 oz size is just right for pet food portioning as a bonus! They are lightweight, sturdy and well constructed. High quality aluminum scoop that is a great size for a variety of uses. Paired with a 6 or 8 oz scoop, it can scoop anything you need it too! It feels really solid in the hand, especially considering the price. These scoops are perfect for the candy bar we are having at our event. They look professional and are much better than any plastic scoops we looked at. We will be reusing them time and time again for around the house and other events! If you put it in the dishwasher it will not be shiny anymore but that was a given. It is great for just scooping out little things from jars I use it for our candy jars that I have nuts in. It's a great little scoop! Nice flat bottom aluminum scoop. Its heavy duty and will stand up every day use and last us a long time. The price was great and half what we seen at other sites. These scoops were purchased to replace plastic 6 oz scoops. These are a much more permanent solution for our bulk self serve candy store. They are very durable and solid in construction. I love the flat bottom as it makes it much easier to scoop things out of our jars. Even though they are 4 oz scoops, they hold quite a bit. Great product, will be ordering more soon. This is a surprisingly sturdy and heavy weight scoop. I thought it wouldn't be a durable as a stainless steel one, but it is very substantial. Perfect size for my container. These scoops are great for the price. they feel sturdy enough to last a long time and the size is perfect to scoop smaller amounts into tin tie bags. they are slim enough to fit into the bags so there is no spillage. You can also use the One Piece Flat Bottom Aluminum Scoop - 4 oz. to mix the dry dog food with the wet dog food. The scoop is easy to clean and very sturdy. The aluminum flat bottom scoop is something that we have found a bunch of uses for. Great deal. Very nice looking, sturdy scoop! I use in a one gallon jar I keep dry cat food in-it fits well & helps measure out just the right amount! Perfect for both and is quick and efficient. Also cleaner! Perfect and stylish for my customers to scoop out their own bath salts or teas in their bags. The scoop is a great metal and will last for years. I love using these scoops to send out accurate portion sizes for food delivery. Takes the guesswork out of making consistent portions. They are also quite durable and stay shiny after repeated washings. This feels sturdy, but not unbreakable. You don't need to have massive storage or stock of candy to get use out of this; it's very handy to have around. Please flatbottom aluminum scoops are awesome, they are very great for scooping and very high-quality aluminum have a nice look to them. We have purchased two different sizes both are great. I like these scoops. They seem to be built well and are sturdy but not too heavy, which can be a problem with these tools sometimes. I will definitely be buying these again. Fantastic sized product. I have candy jars for a graduation party and they fit perfectly - they weren't too large and gave a good portion size. They're a lot smaller than I anticipated. But overall a solid piece - nice quality metal that won't easily bend like some of the other things I've purchased. Just wished they were a little larger. Solid piece of equipment. One piece design makes it tough, flat bottom is nice, for the price you will not find a better scoop. Use these everyday. Wish the scoop was a little smoother. It has a textured coating. Other than that, it does what it says and it seems pretty sturdy. I like the look of these scoops. They are very stylish in all my half gallon canisters. I also like how well made they are. They look like they will last and won't discolor for many years to come. We ordered the 4 oz. aluminum scoop for serving ice at our wedding. Its a little bit smaller than I though it would be, but I think the size works perfectl. I would recommend buying this - it is really cute and you probably can't find it cheaper anywhere else. These scoops were the perfect size for the candy/ snack buffet at our wedding! The look classy and are great quality, I would highly recommend! They're a little bigger than I was expecting, but they do their job. I like having a scoop instead of using a measuring cup to scoop things out. These scoops pair perfectly with the gallon penny candy jars sold here. They have a very nice metal finish and look really high end. I was extremely impressed with the quality of the product. Made sturdy and easy to keep clean. they come in many sizes and are good for many uses. I highly recommend this item for any type of establishment. This 4 ounce one piece flat bottom aluminum scoop is great. It is also a good size to use for scooping dry, wrapped ingredients for our bakery. At this price, I will be purchasing more. These aluminum scoop are absolutely great. It is the perfect size to put in a small container. I like that it fit in my containers. Nice small size for scooping small portions. This doesn't have a smooth surface. This helps as I'm scooping so that I can keep a good grip on the scoop. The bottom is flat which helps the contents stay in the scoop if I have to put the scoop down before emptying it. We bought this scoop our product. It is the perfect size to fit into a gallon jar. The flat bottom keeps it steady on the counter when its not in use. A good size for scooping, a handy tool to have when baking. There is some slight discoloration on ours when you look closely and it does look kind of cheap. But it is sturdy and well priced. As a home user, if you are looking for something more than just functionality, for something pretty that looks nice on your counter, I would suggest something else. I ordered these for doling portions, but find I've also been using them to dish out homemade snacks. They work well, are metal (better than plastic), and are a worthwhile investment. Great little scoop. Love the 4-oz. size as it is a nice size to fit in my jar. Very sturdy and love the textured aluminum finish as it does not show fingerprints. Can't beat the price. Will be back for more of these. I purchased these scoops for use on a candy table and they were perfect! The size is small enough to fit in the glass vases, yet sturdy enough to reuse. These are made of a great aluminum and the price cannot be beat. These are great little scoops. We recently started a candy buffet business and these scoops are just the right size to scoop out the candy from the jars. Good price.... good product! So much cheaper than the ones you'll find in local stores but at the same time, they seem to be of quite good quality. I'd recommend not putting them in the dishwasher, I did that on some that I bought elsewhere and it stains them. Great small scoop. Useful for small spaces. The flat bottom stays on a table without twisting. It is well priced too. I needed to find one of these for while now. Who in my shoes would pass up this deal? I'm using this right now for scooping my dogs food out of the bag into their bowel. Its a great product! I used a variety of these Aluminum scoops at the candy table at my wedding. People loved that they didnt have to put their own hands in the containers. A great small scoop that is perfect for a variety of uses! Nice for scooping! Aluminum material is sure to stand up to a lot of use! !